Can’t make your newly downloaded eclipse mars to work? 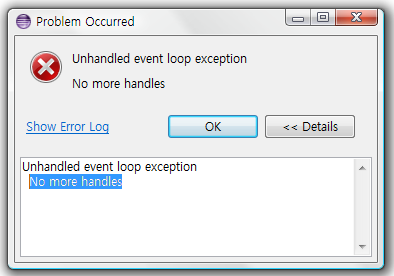 Are you facing an error “Unhandled event loop exception No more handles” prompt when focusing on the texteditor area of eclipse? then followed by SWT error asking you to close the workbench? You are not alone, last time I got this error, some say it’s related to multiple monitor configuration, however for my case I notice it went away after I had closed my Teamviewer application but I the problem is need the Teamviewer on all the time. So after googling around, I manage to find the solution and it was only a simple windows update! Seems like it’s a windows related bug. after the update eclipse worked, even with my teamviewer is on.